So many things can go wrong when an elevator gets stuck, but so many things can go right. Just like this book. Definitely the cutest story so far this year. I feel like I have over-used the word “cute” already this year but there is absolutely no way I could not use it to describe this book. But, I mean, there was absolutely nothing about it that wasn’t cute. The relationship between Owen and Lucy has the total “awwww” factor and there was travel and adorable nicknames. 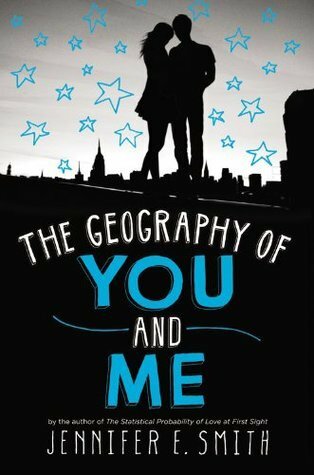 I definitely liked The Geography of You and Me better than This is What Happy Looks Like (both by Jennifer E. Smith) because while I liked both stories, I liked this one and the characters a little more. I’m a huge fan of the cover of this book. I love the blue and I think that it totally suits the tone of the book. I can’t wait to see it in stores, I think the physical copy will look amazing. Not only did I like the main relationship, but also that of Owen and his dad. Seriously there’s a scene in there between them that almost brought me to happy-tears. No joke. Then there was all this amazing travel side to the story. Not only were there some American places featured but also others like Edinburgh and Prague. If you are any sort of fan of Jennifer’s other books, you really do have to try this one. Or maybe you’re just looking for a cute contemporary and I totally recommend you this then too. Great for Summer, great for travelling even. A meteor shower. A great show.